A RediHeal Case Study – Meet Mina, A Goat from Colorado. A case study on how RediHeal saved a goat. Mina was bitten by a dog. Because she was so beloved (and pregnant) her owners really wanted to do everything they could to save her. The bit was challenging to treat. 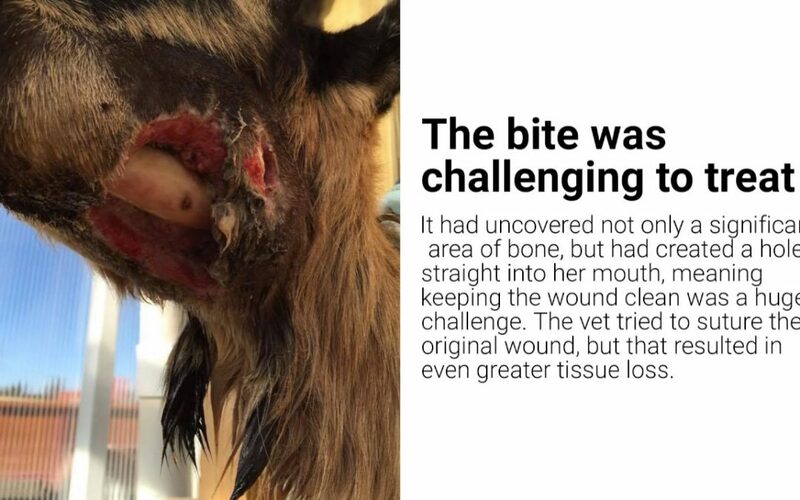 It had uncovered not only a significant area of bone but had created a hole straight into her mouth, meaning keep the wound clean was a huge challenge. The vet tried to suture the original would, but the result in even greater tissue loss. We helped Mina’s owners with a protocol that including using RediHeal, while knowing the wound on the outside of Mina’s face to heal. Mina’s results were dramatic, with rapid healing occuring. Overtime, we were able to help this wound heal enought that Mina could happily continue to eat and she had her baby just a short time later. We’re so proud to have helped with the case.